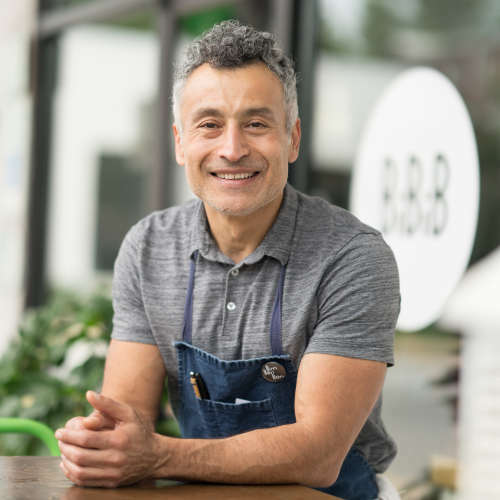 In 1985 Reza left Los Angeles for Asheville – a move that would inspire the small mountain town now nicknamed Foodtopia for its thriving culinary scene. Thirty years later Reza sold his flagship restaurant Rezaz and he and his wife Eva hit the road, traveling with their children’s synth pop band Posh Hammer. In 2017 Reza opened two new eateries. Baba Nahm in Downtown Asheville’s Grove Arcade is grab and go Middle Eastern cuisine. BimBeriBon in West Asheville is the culmination of a dream to help people live better lives through wholesome, delicious, and vital food. BBB serves a global cuisine, entirely gluten free and refined sugar free - dining for everyone from vegans to omnivores.